Lastly, we will consider general mechanisms for signal transduction across membranes of any cell that must respond to its environment. Typically the agent that signals a cell to respond is a molecule (or in the case of light sensation a photon) which binds either to a cell surface receptor or to a cytoplasmic receptor if the signaling agent is hydrophobic. In almost all cases, such signaling activates protein kinases in the cell. Kinases are a class of enzymes which use ATP to phosphorylate molecules within the cell. Hexokinase - an enzyme that uses ATP to phosphorylate hexoses. Protein kinase - enzymes that use ATP to phosphorylate proteins within the cell. (Note: Hexokinase is a protein, but is not a protein kinase). If a protein is phosphorylated by a kinase, the phosphate group must eventually be removed by a phosphatase through hydrolysis. If it wasn't, the phosphorylated protein would be in a constant state of either being activated or inhibited. Kinases and phosphatases regulate all aspects of cellular function. Some people estimate that 1-2% of the entire genome may encode kinases and phosphatases. There appears to be about 518 different protein kinases in humans. Kinases can be classified in many ways. One is substrate specificity: Eukaryotes have different kinases that phosphorylate Ser/Thr or Tyr. Prokaryotes also have His and Asp kinases but these are unrelated structurally to the eukaryotic kinases. There are 11 structurally different families of eukaryotic kinases, which all fold to a similar active site with an activation loop and catalytic loop between which substrates bind. Simple, single cell eukaryotic cells (like yeast) have predominantly cytoplasmic Ser/Thr kinases, while more complex eukaryotic cells (like human) have many Tyr kinases. These include the membrane-receptor Tyr kinases and the cytoplasmic Src kinases. Manning et al. have analyzed the entire human genome (DNA and transcripts) and have identified 518 different protein kinases, which cluster into 7 main families as shown in the table below. Family membership was determined by sequence comparisons of catalytic domains. They have named the entire repertoire of kinases in the genome the kinome. Alterations in 218 of these appear to be associated with human diseases. In this chapter we will review the activation by extracellular signals of the kinases in red in the table above. These kinases phosphorylate other proteins within the cell and through associated conformational and charge changes, the phosphorylated proteins are either activated or inhibited in the expression of biological activity. Cascade of events: A transmembrane receptor WITHOUT ENZYMATIC ACTIVITY binds an extracellular chemical signal, causing a conformational change in the receptor which propagates through the membrane. The intracellular domain of the receptor is bound to an intracellular heterotrimeric G protein (since it binds GDP/GTP) in the cell. The G protein dissociates and one subunit interacts with and activates an enzyme - adenylate cyclase- which converts ATP into a second messenger - cyclic AMP (cAMP) - in the cell. cAMP activates protein kinase A (PKA) which phosphorylates proteins at specific Ser or Thr side chains. Receptors which work through an intermediary G protein usually are single polypeptide chains that span the membrane seven times in a serpentine fashion. Some signals that activate adenylate cyclase and use cAMP as a second messenger include: corticotrophn, dopamine, epinephrine (β-adrenergic), follicle-stimulating hormone, glucagon, many odorants, prostaglandins E1and E2, and many tastants. Figure: Activation of glycogen phosphorylase through activation of PKA. Cascade of Events: A transmembrane receptor WITHOUT ENZYME ACTIVITY binds an extracellular chemical signal, causing a conformational change in the receptor which propagates through the membrane. The intracellular domain of the receptor then binds to an intracellular heterotrimer G protein (since it binds GDP/GTP) in the cell. The G protein dissociates and one subunit interacts with and activates an enzyme - phospholipase C - which cleaves the phospho-head group from a membrane phospholipid - phosphatidyl inositol - 4,5-bisphosphate (PIP2) into two second messengers - diacylglyerol and inositol trisphosphate (IP3). Diacylglycerol binds to and activates protein kinase C (PKC). The IP3 binds to ligand-gated receptor/Ca++ channels on internal membranes, leading to an influx of calcium ions into the cytoplasm. Calcium ions bind to a calcium modulatory protein, calmodulin, which binds to and activates the calmodulin-dependent kinase (CAM-PK). The released calcium ions also activate PKC. As in the previous example, these receptors which interact with G proteins are single polypeptide chains which contain 7 membrane spanning alpha helices. The cycle of degradation and resynthesis of PIP2 is called the PI cycle. Some kinases regulated by calcium and calmodulin include: myosin light chain kinase, PI-3 kinase, CAM-dependent kinases. Ca/CAM also regulates other proteins which include: adenylate cyclase (brain), Ca-dependent Na channel, cAMP phosphodiesterase, calcineurin (phosphoprotein phosphatase 2B), cAMP gated olfactory channels, NO synthase, and plasma membrane Ca/ATPase. Cascade of events: A transmembrane receptor WITH HORMONE-DEPENDENT ENZYMATIC ACTIVITY (tyrosine kinase) binds an extracellular chemical signal, causing a conformational change in the receptor which propagates through the membrane. The intracellular domain of the receptor becomes an active tyrosine kinase which can phosphorylate itself (autophosphorylation) or other proteins. Such kinases are usually active in a multimeric state. Typically, binding of two molecules of a ligand or a ligand dimer to individual subunits of the receptor causes the monomers of the receptor to dimerize. In this form the kinase activity of the receptor is activated. The individual subunits of the multimer are proteins with a single transmembrane helix. Examples are the insulin receptor and epidermal growth factor receptor. Receptor Tyr kinases autophosphorylate themselves, in a process required for their activity. When the receptor is autophosphorylated, other proteins can bind to the cytoplasmic domain of the receptor Tyr kinase where they are phosphorylated. The target substrates phosphorylated by the receptor Tyr kinase are proteins with a common 100 amino acid domain called SH for src homolgy, based on structural homology to another cytoplasmic protein, Src. Src is an intracellular Tyr kinase activated when it binds through 2 SH domains to the autophosphorylated receptor Tyr kinase. Specifically, the SH2 domain has been shown to bind phosphorylated peptides. These domains target proteins to the autophosphorylated receptor Tyr kinase. Many proteins involved in signal transduction have SH2 domains. Some of these proteins also have catalytic domains with kinase activity. Others have phosphatase, transcription factor. or scaffolding domains. Receptors that interact with G proteins (G protein coupled receptors or GPCRs) have common characteristics. GPCRs are single polypeptides which have 7 membrane-spanning α- helices. Over 800 similar GPCR receptor genes are found in humans, each encoding a protein of similar topology but which bind different ligands. Many of the receptors bind to unknown ligands, and hence are called orphan receptors. The β-adrenergic receptor is a prototypical GPCR. Found in muscle, liver, and fat cells, it bind epinephrine and adrenaline which leads to energy mobilization and muscle activation (i.e. flight or fight response). The mechanism of activation of a GPCR is illustrated using the beta adrenergic receptor as an example. The unoccupied adrenergic receptor is associated with a heterotrimeric G protein, which contains an α, β,andγsubunits. GDP is usually bound to the αsubunit. When the hormone is bound to the receptor, interactions of the receptor with the G protein (probably through the βandγsubunits leads to conformational changes in the G protein leading to replacement of GDP with GTP. This promotes dissociation of the αsubunit (with bound GTP), which is then free to bind modulate the activity of an adjacent membrane protein, adenylate cyclase. The αsubunit is held to the membrane through a lipid anchor attached through a post-translational modification. As long as GTP remains bound to the Gα subunit, it will continue to modulate the activity of adenylate cyclase. A built in regulatory mechanism does exist in the protein since the Gα subunit has GTPase activity. The GTP will eventually hydrolyze, the GDP-Gα subunit will lose affinity for its bound partner (adenylated cyclase), and return to the heterotrimeric G protein associated with the unbound receptor. GPCRs appear to bind ligand in a binding cavity localized at the extracellular face and between four of the transmembrane helices. 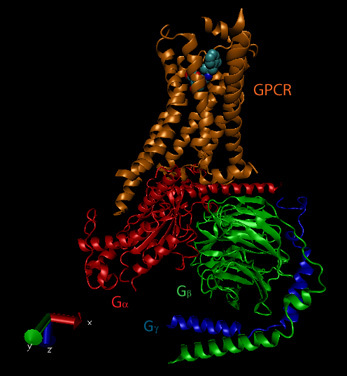 Upon binding of a natural ligand, a conformational change in the arrangement of the helices occurs, allowing access of the Gα subunit to the GPCR. In the ternary complex of GPCR:Ligand:G protein, the affinity of the GPCR for the agonist and of the Gα subunit for GTP (over GDP) are increased. The activity and structure of GPCRs have been studied using natural ligands (hormones and neurotransmitters), as well as agonists, partial agonists, inverse agonists and antagonists. As discussed previously, agonists bind to the natural ligand binding site and elicit the same or a partial response (partial agonist). Inverse agonists bind and lower the response of the constituitively active receptor, and antagonists bind and prevent the normal response of an agonist. The figure below shows a crystal structural of the beta-andrenergic:Gs complex with bound agonist. Some bacterial toxins work by inactivating the GTPase activity of the Gα subunit, keeping it in the "stuck" position. For example, cholera toxin, an enzyme released by Vibrio cholerae , catalyzes the ADP ribosylation of an Arg in the Gα subunit by transferring everything but the nicotinamide from NAD+ to the Arg residue. In contrast to the beta-adrenergic receptor, some Gα subunits actually inhibit adenylate cyclase when bound. These Gα subunits are called Gai/o in contrast to the stimulatory subunits, Gas. Gα subunits interact with proteins other than adenylate cyclase. We have already seen an example with the PKC activation of phospholipase C which is activated by the Gaq11 . There are many different Gα-like subunits expressed in different tissues. Four structural classes and at least twenty variants of Ga have been found. Another variant of a GDP/GTP binding protein is ras. Mammalian cells contain 3 variants of ras: H, K, and N. They all bind GDP/GTP and have GTPase activity, and are members of a large family of small GTPase proteins. This protein is targeted to the cell membrane through the post-translational addition of a hydrophobic farnesyl group. When activated by binding to GTP, it can to and activated a protein call Raf-1, which is activated to become a tyrosine kinase. Changeux and Edelstein reviewed the MHC model 40 years after its conception and support its application to signal transduction processes. They include in siganling molecules not only hemoglobin, but regulatory enyzmes (aspartate transcarbamylase, phosphofructokinase, LDH, glycogen phosphorylase), membrane receptors (acetylcholine receptor, rhodopsin), and nuclear receptors (lac repressor, steroid hormone receptors). In all these signaling proteins, residue distant from the "active" site participate in binding to allosteric ligands. Often the allosteric site is on a separate domain which can be cleaved from the protein and still maintain allosteric ligand binding properties. The proteins also consists of multiple subunits easily related by distinct symmetry axes. Allosteric ligands often bind in cavity in subunit interfaces along symmetry axes. In general, crystal structure analyses show that low affinity T and high affinity R forms of the signaling proteins exists, but accompanied by minor tertiary structure changes in individual subunits (i.e. perfect symmetry in all subunits is not preserved on binding of allosteric ligand). For neurotransmitter membrane receptors, these two states can be correlated with an open and closed state (for ion flux), and open conformations of these proteins can often be found in mutant forms. However, for many ligand-gated ion channels and G-protein coupled receptors (serpentine), kinetic analyses show more complicated forms than can be represented by a simple two state (R and T) model. High-resolution microscopy shows evidence for nonsymmetrical quaternary structural changes. These change can be observed in the absence of ligand, which gives support to the MWC concept that allosteric ligands select certain conformational states, leading to equilibrium shifts in the unliganded receptor to the more high affinity state. More refined methods of structural analysis will presumably show more evidence of subtle tertiary changes in the proteins that are preludes to quaternary structural changes. Yet the simplicity of the MWC model for explaining many features of signaling proteins remains. GAP - GTPase Activating Proteins: These proteins facilitate hydrolysis of bound GTP hence downr egulating the activity of the G protein. GEF - GTP Exchange Factor: These types of proteins facilitate GDP to GTP exchanges, hence activating the G protein. There are seven types of MAPKs, four conventional and three atypical. Four typical ones are described in the table below. Type 2 diabetes, in which people become resistant to insulin which leads to high blood sugar and the cascade of health consequences that follow, is pandemic in the world. Hence a brief look at two of the kinases downstream of the insulin receptor tyrosine kinase is warranted. When insulin binds to the receptor tyrosine kinase (RTK), it phosphorlylates itself, which then leads to the binding of other proteins to the activated receptor and their phosphorylation. One of these proteins leads to changes in gene transcription. The other, Insulin Receptor Substrate 1, IRS1, a "scaffolding protein" leads to the movement of the GLUT4 protein (Glucose transport protein) to the cell surface. These activities are shown schematically in the figure below. After phosphorylation by the activated insulin receptor protein tyrosine kinase, IRS-1 binds phosphatidylinositol 3-kinase (PI3K) that causes phosphorylation of the 3'OH on phosphatidyl inositol (PI) in the inner leaflet of the membrane to form PI(3)P. PI3K is a member of a family of kinases that phosphorylates pI. The metabolic pathway centered on pI3K is one of the most mutated in human cancers. PI(3)P in turn recruits to the membrane other inactive kinases, phosphoinositide-dependent kinase 1, PDK1 and Akt, also known as PKB. On binding of PI(3)P, PDK1 becomes an active kinase, which phosphorylates and activates Akt. The family of three Akt kinases are major Ser/Thr protein kinase that phosphorylates proteins involved in a host of cell activities, including regulation of glucose transport, cell proliferation and death. 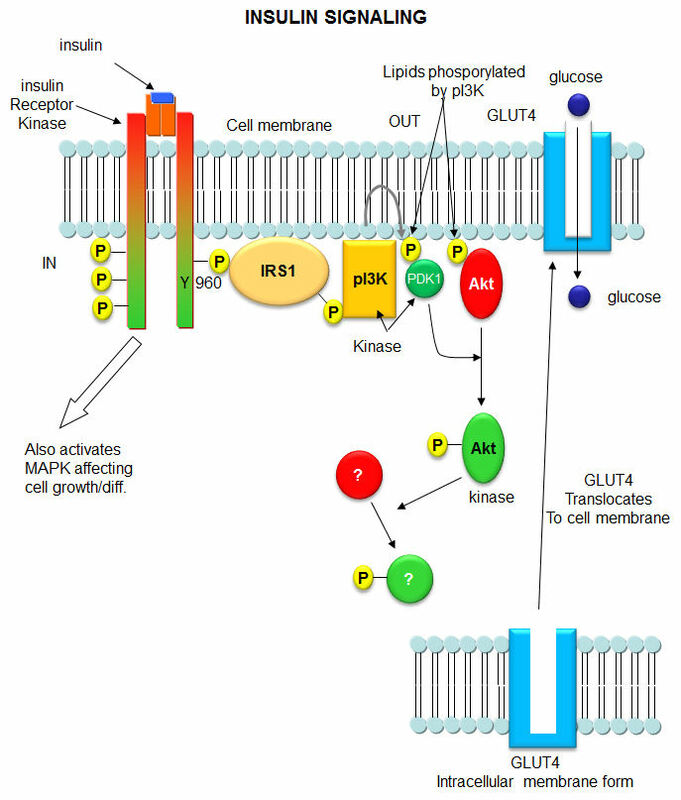 In the insulin signaling pathway, active (phosphorylated) Akt leads to movement of the GLUT4 protein from intracellular endosomal vesicles to the cell surface, which offers a quicker way to import glucose into the cell that if Akt activated GLUT 4 gene expression. In a red blood cells, the concentrations of ATP, ADP and AMP are approximately 1850 uM, 145 uM and 5 uM. Even in cells that use lots of ATP (muscle for example), ATP never falls by much. Using the values above and simple general chemistry, an 8% drop in ATP would lead, through the action of adenylate kinase, to an ATP concentration of about 1710 uM and an AMP concentration of 20 uM, a value still much lower than ADP and ATP. However, this represents a 4 fold increase in AMP which, even with the low actual concentration of AMP, leads to activation of AMPK. Another "normalized" indicator of cell energy status (or "charge") is the Energy Charge, EC. It is defined by an equation that give an EC value from 0-1 where 0 indicates that all AXPs are in the AMP form, and 1 where only ATP is present. The numerator of the equation of EC below represents the number of moles of phosphoanhydride linkages in the AXP pool and the denominator the number of moles of AXPs. The 1/2 term allows the bracketed term to equal 1 when only ATP exists and 0 when only AMP exists. The EC values of cells is regulated to remain around 0.85.
allosterically activates by ten-fold the kinase activity of the catalytic alpha subunit (a secondary effect). ADP has no such effect. These effects are altered by the markedly higher concentrations of ATP which counteracts all these effects, enhancing the Energy Charge sensor activity of this enzyme. The gamma regulatory subunit has 4 binding sites for AXP. Crystal structures show site 2 is empty, site 4 is always bound to AMP and sites 1 and 3 can bind AMP, ADP, or ATP (Xiao et al, 2011). Site 1, which mediates the allosteric effects on AMPK binds all AXPs with similar affinity. This appears paradoxical since given the high energy charge, one would expect ATP and ADP to outcompete AMP for binding. However, it was found that the Mg2+ -ATP complex has marked lower affinity for the site, allowing both AMP and ADP, which under cellular conditions are mostly not bound to Mg2+ while ATP is, to outcompete Mg2+ -ATP for binding. Site 3 binds AMP and ADP with a 30-fold lower affinity but on binding protects p-AMPK from dephosphorylation of Thr 172. What effect does activated AMPK have on the cell? Active AMPK activates liver glycolysis (byphosphorylating phosphofructokinase 2 which forms F2,6-BP, an activator of PFK) and inhibits by phosphorylation enzymes inovled in fatty acid synthesis (acetyl-CoA carboxylase), glycogen synthesis (glycogen synthase) and cholesterol synthesis (HMG-CoA reductase). Yeast AMPK has recently been shown to be also controlled by acetylation of the equivalent beta subunit (Sip2). Acetylation increases its interaction with the alpha catalytic subunit (Snf1) which decreases its kinase activity. This decreases phosphorylation of downstream kinases (including an analog of Akt1 called Sch9) which slows growth and increases longevity. Normal aging is associated with decreased acetylation of Sip2. There are three main families of phosphatases, the phospho-Tyr phosphatases (PTP), the phospho-Ser/Thr phosphatases, and those that cleave both. Of all phosphorylation sites, most (86%) are on Ser, 12% involve Thr, and about 2% on Tyr. They can also be categorized by the molecular sizes, inhibitors, divalent cation requirements, etc. In contrast to kinases which differ in the structure of their catalytic domains, many phosphatases (PPs below) gain specificity by binding protein cofactors which facilitate translocation and binding to specific phosphoproteins. The active phosphatase hence often consists of a complex of the phosphatase catalytic subunit and a regulatory subunit. Regulatory subunits for Tyr phosphatases may contain a SH2 domain allowing binding of the binary complex to autophosphorylated membrane receptor Tyr kinases. Protein phosphatase 1 (PP-1 or Ppp1) - This is the most abundant PPPs in humans. Different regulatory subunits target this to the liver glycogen particles (GL subunit), striated muscle glycogen and sacroplasmic reticulum (GM subunit) or smooth muscle fibers (M subunit). It is also present in the nucleus where it is presumably involved in regulation of transcription factors. It is also involved in RNA splicing and signaling at neural synapses. Protein phosphatase 2A (PP-2A or Ppp2) - is a trimer with catalytic, regulatory, and a scaffolding (also regulatory) structural subunits. It is found mainly in the cytoplasm and is involved in a myriad of cellular process. PP1, 2A and 2B share a great deal of amino acid homology, and based on this homology, belong to one family. PP2C belongs to another. PPs are often categories into three families including, phosphoprotein phosphatases (PPPs) and metal-dependent protein phosphatases (PPMs). There about 30 catalytic PP subunits (many fold fewer than Ser/Thr Kinases). They gain specificity by binding numerous modulatory regulatory subunits. As with other proteins, the names given to the proteins when discovered often do not reflect an organization scheme that would name different members based on structural similarities. 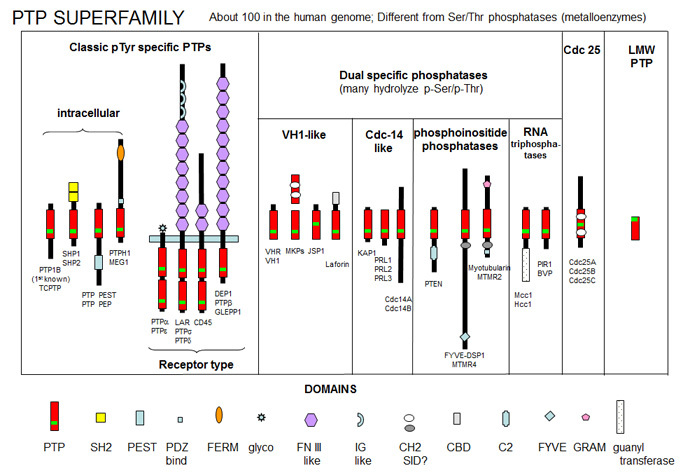 PP-1, 2A, and 2B are better named Ppp1, Ppp2, and Ppp3 which denotes member of the Protein PP (PPP) family. PP-2C would be named Ppm1 as the first member of the PPN family. All PPPs have three short sequence motifs that bind divalent cations. PTP1B - dephosphorylates many cell surface receptors (insulin, EGF, PDGF) that have been phosphorylated on Tyr residues. Its main activity seems to dephosphorylate nascent receptors in the endoplasmic reticulum before they get to the final cell membrane destination. Low molecular weight PTPase - These have roles in metabolism and differentiation of cells. They have a molecular weight of 18,000 and have an active site CX5R-(S/T) motif, where the C (Cys) is an active site nucleophile. We have previously shown that the redox state of a cells affects protein folding and disulfide bond formation as well as the health of a cell. It should not be surprising then that the redox state of a cell is regulated and also that the redox state of a cell regulates cell activity. Consider a reactive ROS and potent oxidizing agent, hydrogen peroxide. We have described the potential deleterious effects of this molecules on lipids, nucleic acids, and proteins. At the same time, it can act to protect a cell. This is clearly seen in the case of immune cells like neutrophils, which can engulf microorganisms, and kill them, in part through generation of ROS like hydrogen peroxide formed after an oxidative burst of activity. Hydrogen peroxide is generated in neutrophils through the action of NADPH oxidase (Nox), which catalyzes the production of NADP and H2O2 from NADPH + O2. The neutrophil must be protected from the effects of the H2O2 which rises to mM concentrations, but destruction of H2O2 must be minimized while it acts to kill the microorganism. Nox, a membrane protein found on the cell membrane, produces H2O2. It's also found in phagosomes, which contain Nox from the cell membrane. For H2O2 to regulate cell activity, it must translocate into the cytoplasm. Cytoplasmic H2O2 has been shown to regulate signal transduction pathways by chemically modifying Cys residues in key signal transduction proteins. Phosphatases, which contain an active site Cys in a Cys-XXXX-R catalytical loop, can be reversibly oxidized by H2O2. The Arg side chain decreases the pKa of the active site Cys, making it a better nucleophile toward phospho-tyrosine substrates and more susceptible to H2O2oxidation. This inhibition, which can be reversed on addition of thiols, is also observed on stimulation of cells with various external signaling ligands and leads to an increase in the phosphorylation state of proteins, altering signal transduction pathways. These changes correlate with increased cytoplasmic H2O2. In addition, it has been shown the oxidation of two Cys side chains in Src, a protein kinase, activated the enzyme in a process that correlates with the appearance of H2O2. For these H2O2-dependent events to occur, the H2O2 must be protected from enzymes like catalase, but more importantly peroxiredoxin, which is found in the cytoplasm. These enzymes have been shown to react with two H2O2 molecules, which inactivate them as one of the two Cys is coverted from RSH to RSO2-. (Rhee, 2006) Another eukaryotic protein, sulfiredoxin, can reverse this inhibition. Nox is assembled in highly specific subcellular regions of the membrane such as lipid rafts and focal complexes(between the cell and the extracellular matrix). H2O2 is imported into the cell. For some membranes H2O2 is easily diffused across the membrane, but recent studies have shown other membranes lack this permeability. In this case aquaporin may regulate the transfer. Furthermore, Nox protein assembly has been discovered in organelle membranes such as the endoplasmic reticulum and nucleus. H2O2 produced in these regions is held within the lumen of the organelle. You may have noticed above that some signaling molecules, whose effects are regulated by kinases (β-adrenergic and some olfactory signals by PKA and acetylcholine by PKC for example), are neurotransmitters. In the previous chapter section, we discussed how neurotransmitters can act as signals to open ion-specific, ligand-gated membrane channels, which change the transmembrane potential. In other words, the neurotransmitters gate the channels directly. Typical examples of channels directly gated by neurotransmitters are the acetylcholine receptor in neuromuscular junctions and the Glu, Gly, and GABA receptors in the central nervous system. These receptors are multimeric proteins. Receptors with direct gating of ion flow are fast, with activities that last milliseconds, and are used in eliciting behavioral responses. open the channel normally closed at the resting potential and produce an effect like gating. close a channel usually open at the resting potential (such as nongated K channels which when closed would depolarize the cell and make it more excitable). cAMP opens cation channels in olfactory cells after activation of the olfactory receptor by odorants. the β-adrenergic receptors are phosphorylated by PKA and PKC (activated by stimulation of a different neurotransmitter receptor linked through a G protein to produce increased levels of second messengers cAMP and diacylglycerol). When phosphorylated, the β-adrenergic receptor, itself activated through G protein) can't bind Gs. This in affect attenuates the response of the β-adrenergic receptor to its own neurotransmitter which leads to desensitization to that signal. cAMP activated PKA can phosphorylate an inactive transcription factor in the cell, which then can bind to a section of DNA called the cAMP Response Element (CRE), which is upstream of certain genes, leading to the transcription of the genes. The transcription factor is called CREB for cAMP Response Element Binding protein. Example: tyrosine hydroxylase (a monooxygenase) is involved in the synthesis of epinephrine and norepinephrine. The activity of this protein is increased when it is phosphorylated by PKA. Hence its activity can be increased quickly by this modification of the already present protein. If an animal is subjected to severe or long term stress (cold or immobilization), presynaptic cells with norepinephrine will be stimlulated to release the neurotransmitter. This requires continual synthesis of the neurotransmitter by the presynaptic cell. The increase in synthesis of this neurotransmitter is caused by the presynaptic cell being stimulated by another neuron, whch leads to increased levels of cAMP, and ultimately activation of CREB which increases transcription of the hydroxylase gene. Caffeine clearly produces a state of arousal in the central nervous system. High levels appear to block the binding of an inhibitory neurotransmitter, adenosine, to the A2A adenosine receptor. In the absence of caffeine, adenosine levels rise during the day, which promotes interaction with its receptor, leading to increasing sleepiness and lack of concentration. When adenosine binds normally to its receptors, it activates the adenylate cyclase cascade, which activates PKA, leading to changes in phosphorylation state of many proteins inside the cell, including protein phosphatase (2A). These changes inhibit neural firing. Caffeine blocks these changes. With the determination and annotation of the human genome, it has become very clear that a significant fraction of the human genome (about 40% of the 58% of known genes determined by Venter et. al. and published in Science, 291, 1335, 2001) is devoted directly or indirectly to signal transduction processes. These include signal molecules, receptors, kinases, regulators, protooncogenes and ion channels. The chart below shows the relative distribution of over 26,000 genes of known function (with 42% still of unknown function. Stanford Human Plasma Membrane Receptor web site.